As most of you know I have been writing my blog for some time now. I started in 2011; it was one of the requirements for my coaching course. From the beginning of this blog, I’ve always wondered if I am able to do this well. Is my message good enough? Is it understandable the way it is written? I have been trying so hard, stressing out over it, and losing my sense of humor about it completely. I need to loosen up, find a place where there are other bloggers – a place to learn, to grow and to feel supported. So the first step for all of this for me has been to join the Bright-Eyed & Blog Hearted course. I feel so energized just by stepping up to the plate, for me and for you as well. Do you know that feeling of making a decision and just to let go and trust? 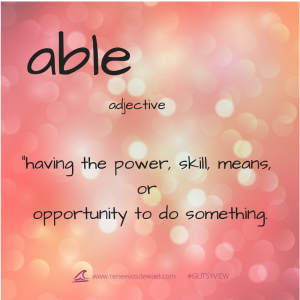 To be able means to have the power, means, skills, and opportunity to do something. For me it is to share my messages/guidance, to share what I download, to share words and stories that keep coming back in my thoughts. I don’t always understand what these messages mean myself. I have no clue where they come from most of the time, but I really truly feel and understand that it is important for me to write them down. This is something that I have been doing for a long time, more as personal notes. When writing them here in my blog I always write with a lot of doubt in my voice. A lot of the doubt has to do with my ability to write. In the past I have been ridiculed and laughed at by teachers and peers. This is something that I have shared before and you always have been very kind to me with your compliments and support. (Thank you.) In many ways I have tried to let go of that fear. In the time we are at right now, it is very important to let go of this fear. Too much fear is in the world at the moment, and this energy is suffocating us. So I am joining the ability train and wherever it takes me, it will be okay. Going on an adventure is not something new to me, so it is time to stop thinking about how marvelous others are in their writing and join them in the fun. It’s time to stop thinking that they are hipper (not sure if that is a word), funnier, and more to the point. I am joining the tribe as me, with my words, my sense of humor and my ability to be hip in my own way. I’ll trust the messages I am getting and the stories are perfect in the way they come to me. If I don’t understand, of course this part I will share as well. We are all students of life in one way or another. So I’m stepping out of the darkness and into the light, shining brightly! I invite you to join me on this train, on this adventure of being able to do what we are here to do and to enjoy the adventure that will come with it. We all have the power, the means, the skills and the opportunities. 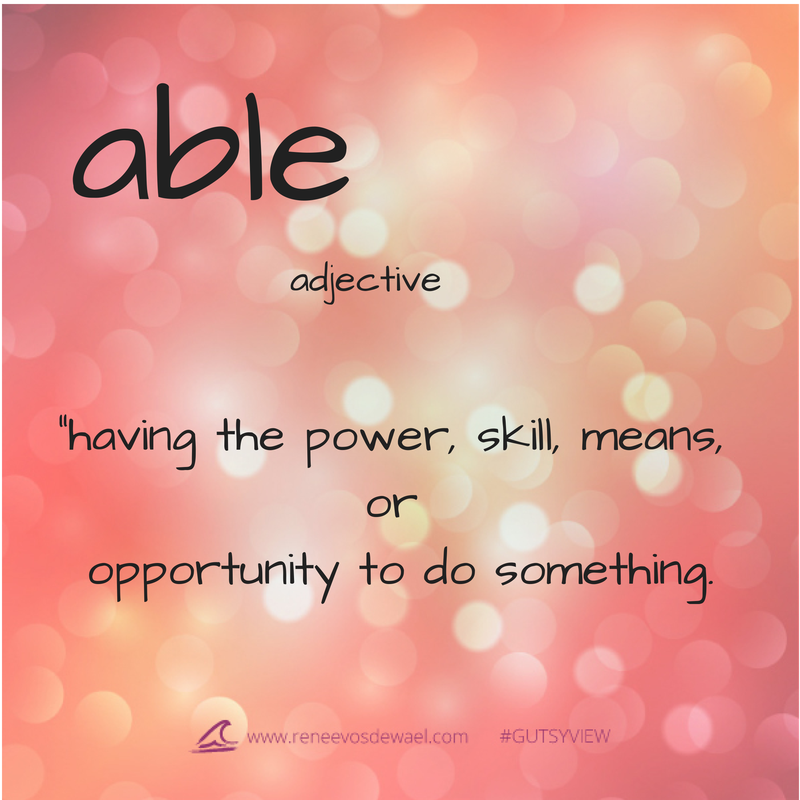 We are all able, because we have our own set of gifts and talents. Let’s look for people who support us, teach us, and create a safe place where we can learn. Leave me a message about what you are going to do on the train of being able. The rainbow is joining us and will show us many different colors on the way. This entry was posted in Personal development and tagged able, blog, Bright-Eyed & Blog-Hearted, Change, Coaching, emotions, Finding Yourself Through Intuition, good vibes, Gratitude, Happy, inspiration, intuitive, journal, life, personal development, Rachel MacDonald, thoughts, train. I’m trying to work on positive thinking in staid of negative thinking and your message fits perfectly. The first thing that popped into my head, when someone doesn’t understand your message, perhaps it’s not an important message for them right now. And the things you have to work the hardest for, are the thing you will be most proud of. So I’m stepping on board of your your ability train as well and taking my chances! So good to hear your voice in whatever form it is coming through (in person, via internet, Skype or however else.) I hear exactly what you’re saying and it’s so wonderful to witness how you are always looking for ways to make what you do better, and knowing that it’s important not to judge yourself. I’m taking an online course right now called “Feminine Power,” and I’m learning how to do exactly what you said about recognizing our gifts, strengths, abilities and what we came here to do, sharing the process of coming fully into our creative selves through the strength of community. So I support this work you are doing and applaud you for doing it in such a courageous way. Yeah! I believe in you and in me and in us all to shine our lights as you so wonderfully do. I also am receiving this message in divine timing as I am about to launch a new website and expand my work here. I feel clear that I am to fuse my own unique “sparkle” into what I do and how I do it without shrinking in fear. Your post reminded me of what my heart is saying…SHINE ON! Sending you a big tall hug!